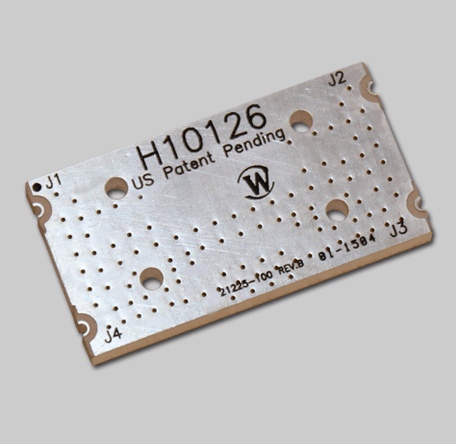 The Model H10126 is a surface mount 180° Hybrid covering a full 2 to 6 GHz at 100 W CW. Measuring just 1.15 x 0.6 x 0.31", this unit is ideal for combining applications encountering 2nd order harmonic conditions and for combining two lower power 90° Hybrid Couplers. The H10126 provides excellent phase tracking and 20 dB port-to-port isolation. The Model H10126 is a surface mount 180° Hybrid covering a full 2 to 6 GHz at 100 W CW. Measuring just 1.15 x 0.6 x 0.31″, this unit is ideal for combining applications encountering 2nd order harmonic conditions and for combining two lower power 90° Hybrid Couplers. The H10126 provides excellent phase tracking and 20 dB port-to-port isolation.